Quaint post and pier log cabin on 6.28 acres for sale in Georgetown Lake Estates with small seasonal stream. The cabin has a master bedroom on the main floor and a loft bedroom with half bath. 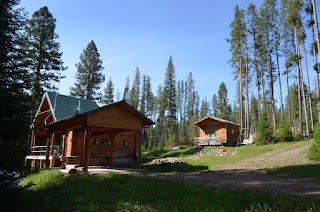 Additional outside features include carport, guest cabin with sauna, rustic bunkhouse, workshop, and storage building. Property is approximately 8 miles to Philipsburg, Montana, and close to Georgetown Lake, Discovery Ski area, Echo and Rock Creek. Trout fishing is great in this area! Property would make a great base-camp while enjoying all the area has to offer. Listed for $208,000. Call Dauenhauer Real Estate at 406-239-5563 Listed for $208,000.